Although this coffee shop isn’t part of the Indie Coffee Passport, I couldn’t give up the opportunity to write about it! On this super gloomy Monday, I got a ping on Facebook messenger from my dad telling me he was in town for a meeting/trade show/business trip thing and that he had a couple of hours to spare. Seeing as I haven’t seen him in a month or so, I was more than happy to make my way downtown for a cuppa coffee with him. 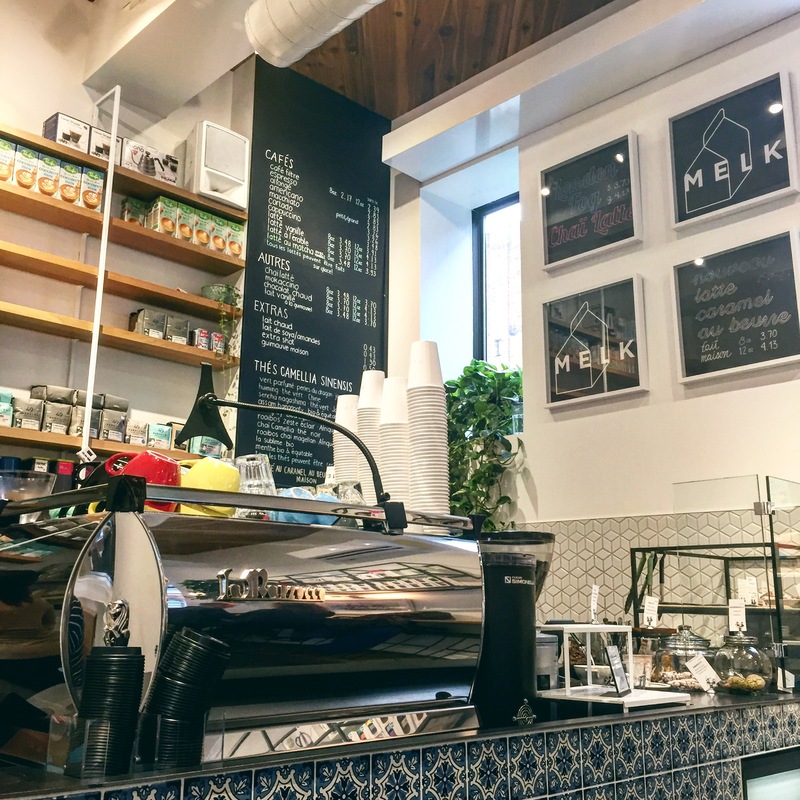 Although there was a Starbucks right next door to his hotel, I asked him to meet me at Melk, a little coffee shop down the street from there, seeing as I want to branch out and try new little places. I had previously walked by Melk last summer after the Pride Parade, but it was jam packed so I didn’t stop. Walking in to meet my old pops, I can really see why it was jam packed: this place is the cutest and tiniest little thing ever. What they lack in floor space, they make up for it with the sky high floor (well counter) to ceiling shelving and storage, a little wall bar, and a handful of little tables. They have a super varied coffee based offerings, as well as a great selection of teas, and treats that are made on the spot. My dad was particularly impressed with their raw & vegan energy bar which he practically inhaled. They offer regular milk as well as coconut, soy, and almond milks, for all those non-dairy “milk” drinkers. Bean wise, they rotate between Detour Coffee (roasted in Burlington, Ontario) and 49th Parallel (roasted in Vancouver, British-Columbia) coffees; you can buy either brand in store (they have a big selection of drip and espresso blends). as well as Keep Cups and other coffee related equipment. Their decaf espresso was spot on, I believe I was drinking the Detour Coffee decaf blend, which had a nice kick mixed in with chocolate and vanilla notes. As always, the decaf placebo effect does the trick! If ever you’re in the core and want to try something different, head down Stanley and you’ll find it located between René Levesque and St-Catherine!